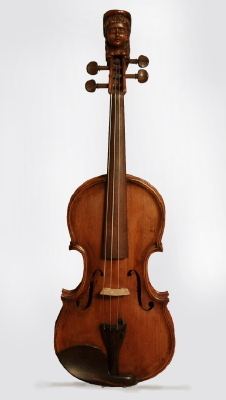 P. H. Holmes Decorative Violin, c. 1862, made in Gardiner, Maine, reddish and golden brown varnish finish. Length of button stop is 14 in. (35.6 cm. ), 8 1/4 in. (21 cm.) wide at lower bout, and 1 1/4 in. (3.2 cm.) in depth at side, taken at the end block. Scale length is 12 7/8 in. (327 mm. ).